Greetings, I am so glad you are here and since you are here I want to take the opportunity and tell you about my aspirations in playing the guitar. I live, breathe, eat and dream guitar. I have been playing for a long time and have a special relationship with my guitar that is very physical, spiritual, philosophical and inspirational. When I place a guitar on my lap and reach my arms around it, it becomes the extension to my arms. It becomes me. I am all about expression and this instrument has become my tongue. With it, I can pour my soul out in front of you and touch your heart. I was born in Iran and moved to the states at 14 to live with an uncle who was a guitarist. Already having been playing the piano for several years, my uncle somehow inspired me to play the guitar. Soon after my arrival here I saw Jimmy Page and my inspiration ballooned to wanting to follow his footsteps. Throughout my teenage years I learned to play Zeppelin and Floyd music and joined several Rock bands. Later in my 20s and after college I joined a Hard Rock band “No Romeo” that was very popular in the Chicago Rock scene and traveled to LA to play a few dates at the legendary Whisky A Go Go and other clubs. Well, like many other Rock musicians with big dreams we hit a brick wall when Electra records, our host, decided not to sign us. I came back to Chicago and decided to hang it up and go to Law School. Just a few weeks before school starts I saw a gentleman playing Flamenco guitar at a club. That was it. It was the moment of truth, the moment that felt like someone just handed me a new start. It was a rejuvenated inspiration. I guess we all need that once in a while. So…..I called the school saying that I am changing plans and please give my seat away. A few weeks later I packed up and went to Spain with a Spanish friend of mine. I bought a guitar and started to study with a few teachers there. I really immersed myself in Flamenco for a decade and some, because it did something very special to me. It humbled me. I consider this another essential in the making of a good artist. I learned to respect this immense and deep art form. I felt so connected to it because it was so similar to Persian classical music. So, I guess there was something inside me that said to me, hey, stay here………..and I did just that. 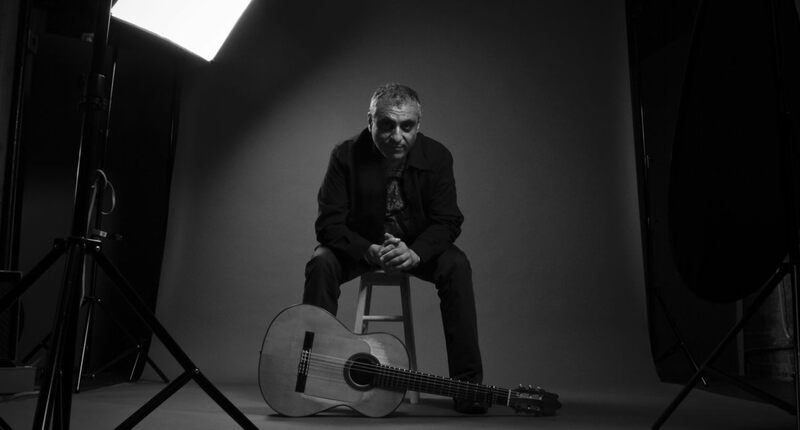 I went back and forth to Spain for the next 10 years and studied with great maestros of the Flamenco guitar. I took most that was thrown at me in and after learning the essentials, started to put my own spin on it and create my own music. In 2009 I started to record my first solo album. I started to write but was distracted by the events that were happening in Iran. I was so touched by the bravery of the People there that decided to write the music by the inspiration they were giving me, another essential in making good music. I believe inspiration is so important. For me, something has to move me and then I will start to write. The album was released in 2010 and it was called “Angels of Persepolis”. 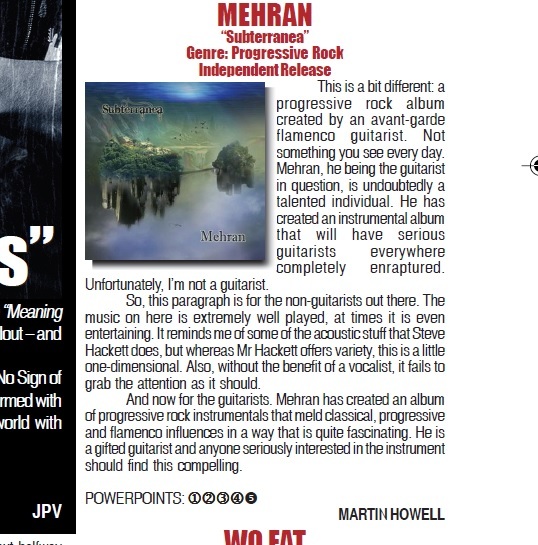 It was very well received by many music critiques around the globe and even got a nice write up in the January issue of Vintage guitar Magazine among so many others including UK’s Pipeline Magazine, progression Magazine, Holland’s IO Pages, Skope Magazine and many more. Vintage Guitar Magazine decided to give me a full page feature and interview on their Feb issue 2011 and even Barry Cleveland of Guitar Player magazine gave it a great review. 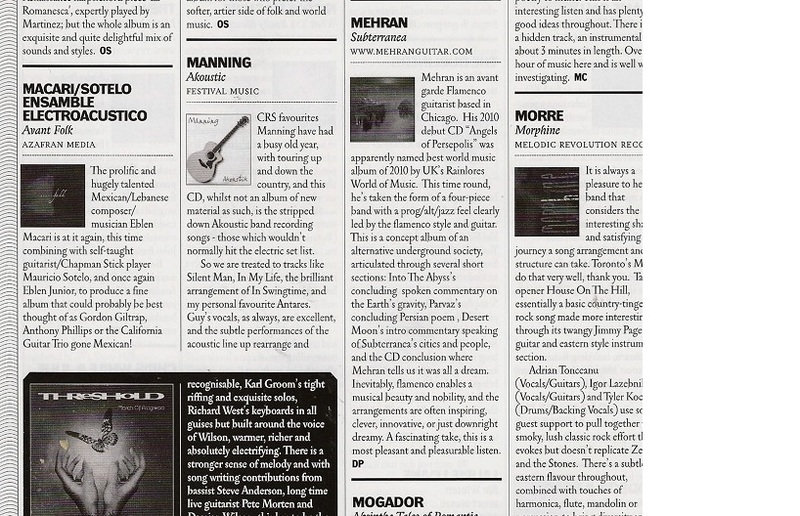 Uk’s Rainlores world of music chose it to be the best world music album of 2010 and NPR’s Wbez and Voice of America Persian TV featured me on their programs. Angels album was getting lots of spins in many other college radio circuits and other public broadcasting stations all over the world. Immediately after finishing the cd I decided that I needed to continue composing new music and that I did. I had a vision for the next Cd but I needed to form a solid 4 piece group to deliver it. I wanted to stray off from Flamenco and create something very new and innovative. I wanted to go back to my roots which were heavily influenced by Pink Floyd and Led Zeppelin and deliver it with clean sound of the Flamenco guitar. To do this I needed to bring in Rock musicians. I started auditioning drummers, bass players and especially keyboardist since keys would be an essential part of the sound. I brought in Sam Werk on the drums, Carl Kennedy on the keys and on bass I brought in a guitar student of mine, Krushanu Joseph. Things started to click very quickly and we gelled as a group very naturally. I started to head into the studio in April 2012 and recorded the song Parvaz, a Solea por Buleria form and from then on everything else just followed. Throughout the recording process I developed the theme and the concept of the album which became a constructive social criticism and an objection to the way humans today treat each other. I developed a fantasy themed underworld called “Subterranea” which was basically the mirror image of our today’s society coexisting with us in a different dimension thousands of miles under the ground. It is a very organic and transcendental civilization which in my mind can provide a template and direction for our civilization. The recording of Subterranea was completed in August 2012 and it was released in Sep 2012. 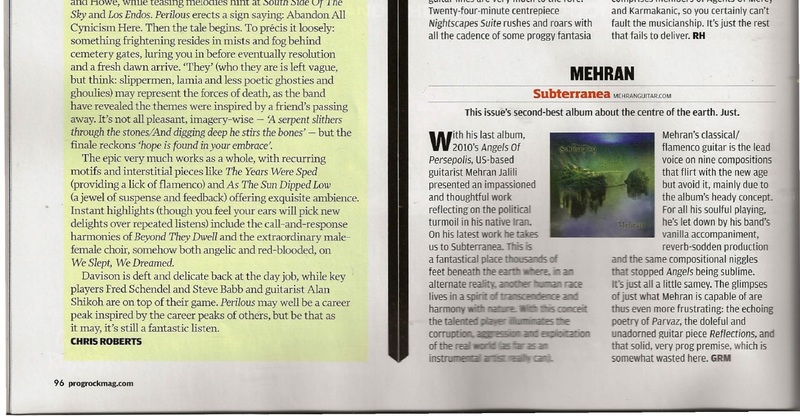 Subterranea is hard to categorize as there are so many influences apparent in it but one of the best descriptions someone gave it was Flamenco under the influence of Pink Floyd. Currently I am composing the music and developing the concept for my third album. We are performing some of the new music at most of the shows to test them out. Hopefully I will be finished with this work in a few months.